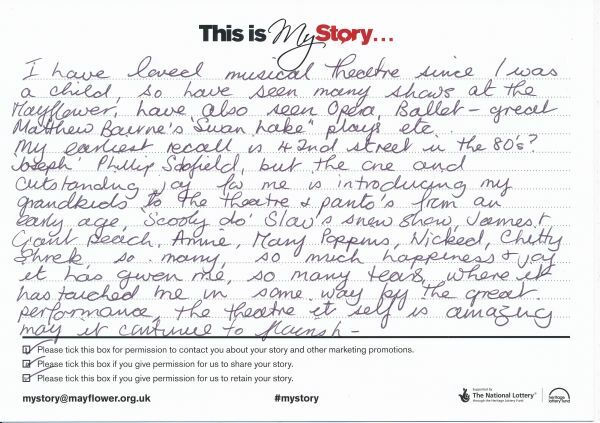 My Story Card: Sue Scott recalls coming to the theatre as a child to see various shows. I have loved musical theatre since I was a child, so have seen many shows at the Mayflower, have also seen Opera, Ballet - great Matthew Bourne's 'Swan Lake'plays ect. My earliest recall is 42nd Street in the 80'? 'Joseph' Philip Scofield, but the one and outstanding joy for me is introducing my grandkids to the theatre + panto's from an early age. 'Scooby Doo', Slow and Snow show, James and the Giant Peach, Annie, Mary Poppins, Wicked, Chitty, Shrek, so many, so much happiness and joy it has given me, so many tears, where it has touched me in some way by the great performance, the theatre itself is amazing may it continue to flourish.